Pope Francis backed the beatification of Salvadoran Archbishop Oscar Romero and spoke out on conflicts in Iraq and Gaza during in a conversation with journalists aboard the return flight from South Korea. 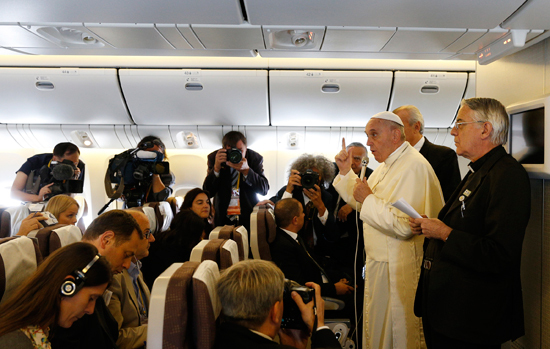 During the press conference Pope Francis also addressed concerns that his hectic schedule could lead to burnout by assuring reporters that he holidayed “at home” and treated his neuroses “with herbal tea”. Elsewhere he revealed that he hoped to travel to the US, Mexico and Spain in 2015, and that he spoke with Pope Benedict XVI frequently. He said that Benedict’s resignation made emeritus popes an institutional possibility rather than an exception, in a similar way to emeritus bishops. “[If I felt I could not go on] I would do the same! I would do the same. I would pray, but I would do the same. He (Benedict) opened a door that is institutional, not exceptional,” he said. He strongly rejected criticism that the prayer for peace between Israel and Gaza that he hosted in the Vatican in June had been a failure because reconciliation was still an option. “It is a fundamental step of the human attitude, now the smoke of the bombs and the war do not let one see the door, but the door was left open from that moment [the prayer]. And as I believe in God, I look at that door and the many who pray and who ask that He helps us,” he said. Revealing details about his day-to-day life at the Vatican, Francis said that he wished he could venture out, but said he did not feel like a “prisoner”. He acknowledged concerns that his demanding schedule had recently forced him to cancel engagements because of illness. “I always take holidays. It’s true. I change rhythm. I sleep more, I read the things I like. I listen to music. That way I rest. In July and part of August I did that [at home],” he said.